When in Manila and you’re excited for the epic 7107 International Music Festival, The Red Hot Chili Peppers has a special message for Filipino fans. In the video, vocalist Anthony Kiedis and bassist Flea are seen promoting the event, urging fans to check out the 7107 IMF website to buy tickets. “I think it’s gonna be fun,” added Kiedis. The Red Hot Chili Peppers is headlining the 7107 International Music Festival, the first music festival of its scale to be held in the Philippines. 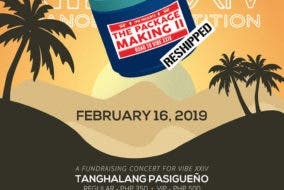 The festival promises to be the sonic event of the year, with huge international names to rock the Global Gateway Logistics City in Clark, Pampanga from February 21-23. The Chili Peppers will be joined by Empire of the Sun, Red Jumpsuit Apparatus, The Galaxy Asteroid Tour, and Natives. Local acts will join the impressive lineup: Up Dharma Down, Yolanda Moon, Pulso, Radioactive Sago Project, and many more. The lineup is an eclectic mix of genres carefully curated to make it a rocking party. If that isn’t enough, the organizers have partnered with the people behind Coachella and Ultra, and there will be a second reveal of the lineup. This is not an event you will want to miss! A limited number of pre-sale passes are available on the festival’s official website. Fans will be able to purchase two-day general admission and VIP admission passes for early-bird prices. The site also offers hotel partners, shuttle service information, and a survival guide. Additionally, 7107 IMF will donate a portion of the event proceeds to help rebuild, rehabilitate and fund relief projects for victims affected by Typhoon Yolanda. Why should you check out the Red Hot Chili Peppers? Check out this post.